Hotel Eurohotel Airport, Vienna. Eurohotel Airport Hotel Vienna. Conveniently located nearby Vienna, Bratislava, the Hungarian border and the Neusiedlersee, the stylish EuroHotel Vienna Airport Fischamend is exceptionally situated along the A4 motorway, a mere 1 km from the train station, 5 km from the airport and 20 minutes from the city centre. Shuttle service is provided only from the airport for your convenience for additional charge. Complimentary parking is also provided for guests who travel by car. For longterm parking we offer special packages. For Coaches and busses the parking space is available with an extra charge. This sleek and modern hotel's spacious, sound-insulated rooms are ideal for restful nights and layovers. The hotel has 114 spacious guestrooms, with one or two queen-sized beds and TV with Sky Sports. Snacks are available at the vending machine in the lobby. 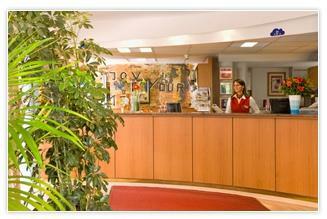 For your convenience, we offer 24-hour check-in, and express check-out. You'll love the comfortable accommodations at affordable prices. Indulge in Austria's rich cuisine at EuroHotel Vienna Airport Fischamend, which is conveniently located near a variety of local restaurants. Or head to Vienna's city centre for a night on the town and enjoy the wide variety of international gastronomy, cosy coffeehouses, trendy eateries, and more.